NOBLESVILLE, Ind.--(BUSINESS WIRE)-- Nexxt Spine LLC, a medical device company focused on designing, manufacturing, and distributing innovative spinal solutions, today announced 510(k) clearance from the U.S. Food and Drug Administration (FDA) and full commercial launch of its SAXXONY® Posterior Cervical Thoracic System—a system designed to stabilize cervical (C1 to C7) and thoracic (T1 to T3) spinal segments via posterior screw fixation in patients with degenerative disease, deformity, tumor, or trauma. 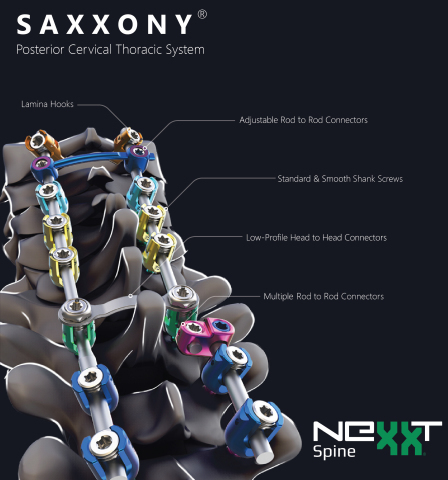 “The SAXXONY® System adds a robust posterior complement to our well received anterior cervical fixation offering as we continue to innovate and grow our fusion portfolio,” said Andy Elsbury, Nexxt Spine President. The comprehensive offering includes standard and smooth shank screws available in a variety of diameter and length combinations, low profile cross connectors featuring multi-axis adjustability, and various configurations of offset, parallel, and axial connectors. The implant offering is complemented by streamlined instrumentation designed to ease rod placement and facilitate procedural efficiency. In order to simplify longer complex constructs, the SAXXONY® Posterior Cervical Thoracic System has been designed to seamlessly link to the INERTIA® Pedicle Screw System with a variety of 3.5 to 5.5mm or 3.5 to 6.5mm rod-to-rod connectors and transition rods. Nexxt Spine, LLC is a privately held medical device manufacturer dedicated to increasing procedural efficiency and patient outcomes through development of innovative products, manufactured on the most technologically advanced platforms, and utilizing irreproachable quality standards to treat painful and debilitating spinal pathologies. The company is growing rapidly and continues to recruit regional sales managers and independent distributors. For more information on Nexxt Spine and its products, please visit www.nexxtspine.com or email info@nexxtspine.com.